雲の中で散歩 「 When You're Through Thinking , Say Yes 」 !!!!!!! 「 When You're Through Thinking , Say Yes 」 !!!!!!! 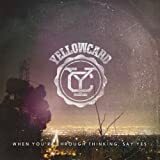 Yellowcard New Album　「 When You're Through Thinking, Say Yes 」 日本盤 Comes Out !!!!!!! !